Coaching And Respite For Family Caregivers Helps Patients Thrive : Shots - Health News Across the U.S., community groups, hospitals and government agencies are stepping up to support the estimated 42 million stressed and strained family caregivers, who are often untrained and unpaid. 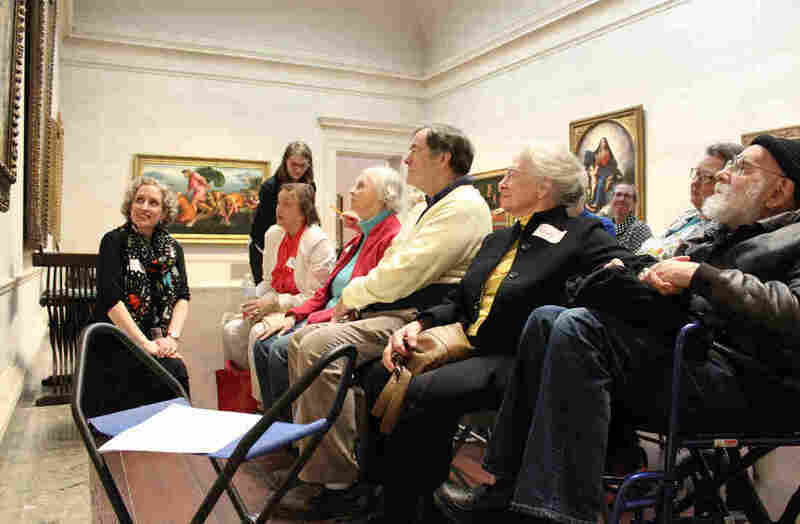 Lorena Bradford (left), head of accessible programs at the National Gallery of Art in Washington, D.C., leads a session of the museum's Just Us program. The program gives adults with memory loss and their caregivers a chance to explore and discuss works of art in a small-group setting. For today, there are no doctor's visits. No long afternoons with nothing to do. No struggles over bathing. At the National Gallery of Art in Washington, D.C., a group of older adults — some in wheelchairs, some with Alzheimer's — sit with their caregivers in a semicircle around a haunting portrait of a woman in white. "Take a deep breath," says Lorena Bradford, head of accessible programs at the National Gallery. She's standing before "The Repentant Magdalen" by Georges de La Tour. "Now, let your eyes wander all over the painting," Bradford says. "Take it all in. What do you think is going on?" "I think she looks sad," says Marie Fanning, of Alexandria, Va., who has Alzheimer's. "Yes. Yes, she looks sad," Bradford agrees. "This is such a gift," Bill Fanning, Marie's 77-year-old husband and caregiver, says of the outing. Across the country, community groups, hospitals, government agencies and nonprofits are starting to do more to support at least some of the estimated 42 million friends and family members who are the primary caregivers of adults and children who have disabilities, are recovering from surgeries and illnesses or are coping with Alzheimer's and other chronic diseases. The National Gallery's program is part of the trend focusing on the health, well-being and education of these caregivers, who are usually unpaid. 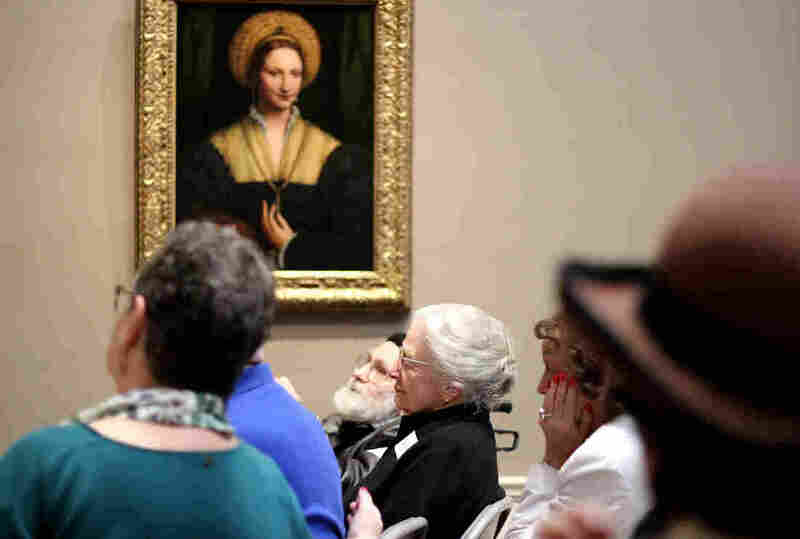 "We know that involvement with art improves well-being," says Carolyn Halpin-Healy, executive director of the Arts & Minds program for caregivers and patients at the Metropolitan Museum of Art in New York. "In our own research for persons with dementia, we see a reduction in apathy," Halpin-Healy says. "For caregivers, we see less isolation and a reduction in stress." She co-founded the program with a Columbia University neurologist, Dr. James Noble, in 2010 at the Studio Museum in Harlem, in New York. The Just Us program in Washington is a spinoff of that program. Other museums in New York and Dubuque, Iowa, have similar programs. Research on other museum-based programs like the National Gallery's Just Us has found that analyzing and discussing art in small groups reduces apathy among people with Alzheimer's, and reduces stress and isolation among their caregivers. A bipartisan law signed by President Donald Trump in January calls for a national strategy to address the needs of caregivers, who are primarily women and provide 37 billion hours in unpaid care to relatives or close friends. All those hours are valued at $470 billion, according to an AARP study. The law will require the Department of Health and Human Services to set up an advisory council and develop a blueprint for government action on financial and workplace issues, respite care and other caregiver issues. At the same time, 42 states and the District of Columbia have passed their own laws requiring hospitals and other nursing facilities to provide training for caregivers who perform medical tasks, and to record them as the "caregiver" when patients are admitted or released from hospitals or nursing facilities. The laws' required designation benefits patients and their families, proponents say. In states without such a law — Alabama, Florida, Georgia, Idaho, South Carolina, South Dakota, Vermont and Wisconsin (Kansas' law takes effect in July) — patients can be dismissed from the hospital without family members being told or briefed fully on what care the patient needs. The CARE Act is "more than just a law," says Elaine Ryan, AARP vice president of state advocacy and strategy. "It's a change in the practice of health care." Family caregivers are almost two times more likely to have emotional and physical problems than other U.S. adults, and three times more likely to have productivity problems at work, according to a 2015 study. The more intense the care, the greater the effects, the researchers found. Dr. Eric Coleman, a gerontologist and recipient of a MacArthur Foundation fellowship in 2012, created the Care Transitions Intervention model. The national program, based at the University of Colorado in Denver, trains coaches to help caregivers ease the transition of a patient to home care. The coaches are usually social workers, nurses or others hired by hospitals and other facilities to work directly with caregivers. Coaches talk to the caregiver before patients are discharged from a hospital. Then they have a one-hour coaching session at the patient's home, and three follow-up phone calls. Studies have shown that having transition coaches can drop readmission to hospitals by 20 to 50 percent, says Coleman. Even if a caregiver is with the patient when doctors give instructions in the hospital or clinic, the medical jargon can go right over their heads, Coleman says. "We tell people that for the next 24 to 48 hours, here are key things you need to do. Then we follow up at home," he says. Caregivers do more than make meals; they also perform medical tasks, like giving medicine, taking blood pressure, changing bandages and more. Yet they receive virtually no training, Coleman says. "I'm a physician, and when I take care of my mom, I have an endless loop in my head" of the to-do list, he says. A 2015 study by AARP found that 46 percent of family caregivers perform medical/nursing tasks, 78 percent of family caregivers manage medications, and 53 percent of family caregivers serve as care coordinators. The majority told researchers they'd received no training in those tasks. Caregivers are "the backbone of our health system," says Alan Stevens, a gerontologist and psychologist who trains caregivers, in partnership with Baylor Scott White, the largest nonprofit hospital company in Texas, and a group of agencies that deal with elderly issues across the state. "If caregivers go away, we have a problem," Stevens says. "It's important to better understand their needs — and to help them." Dignity Health Systems, a large nonprofit hospital company in California, is partnering with the nonprofit Santa Barbara Foundation to provide caregiver coaches. At any given time, 1,000 caregivers are being coached, says Kathleen Sullivan, vice president of acute care services for Dignity. Caregivers are now officially identified as a partner Dignity's health team, Sullivan says. "They're given a badge, they have a tote bag with information, and the hospital knows who to contact." Her group works with nonprofit aging agencies to provide in-home coaches, she says. "When people get home from the hospital, they're just exhausted. They don't remember what they were told in the hospital." In Virginia, the Bay Area Council on Aging and a consortium of four other groups and five hospitals are training caregiver coaches using the CTI program. The key to successful coaching of caregivers is to take training into the home, says Kathy Vesley, of the Bay Area Council on Aging in Fredericksburg, Va.
"Some of these folks are very ill, and they're managing 12-plus medications," Vesley says. "You get into the home and they say, 'Here's my shopping bag of medicines.' And it's literally a shopping bag." The consortium has seen 26,000 patients and caregivers over the past 2½ years. In that time, rates of readmission to the hospital have fallen from 23.4 percent to 9 percent, she says. Coaches help with food, medicine and video training for how to do medical procedures, and help solve issues like how to get patients to appointments with doctors. Out in rural southeastern Virginia, transportation takes a whole new meaning when your driveway is half a mile long," Vesley says. Caregivers also need a little fun and relaxation, says Jason Resendez, executive director of the Latinos Against Alzheimer's Coalition. About 8 million Latinos are caregivers for their family members, Resendez says, and nearly 2 million are caring for family members with Alzheimer's. To bring some of those caregivers together for fun, Latino groups in Los Angeles recently partnered in producing a comedic play, performed in Spanish, about a son who is taking care of his mother. Meanwhile, in Chicago, the Latino Alzheimer's and Memory Disorders Alliance holds caregiver trainings and free dance classes — where caregivers can learn to dance salsa. "It's not just about translation," Resendez says. "It's not just about handing out pamphlets." Kaiser Health News is a nonprofit news service, and editorially independent program of the Kaiser Family Foundation. It's not affiliated with Kaiser Permanente.